The title says it all. Cate Gardner’s newest short story collection, Strange Men in Pinstripe Suits is now available for pre-order! And if you do it now, you get $1.99 off the cover price. Not a bad deal. Let’s help kick off the contest! The ‘Strange Men in Pinstripe Suits’ award is given to only the strangest of folk, and as the recipient of such you are deemed very strange indeed. Congratulations. 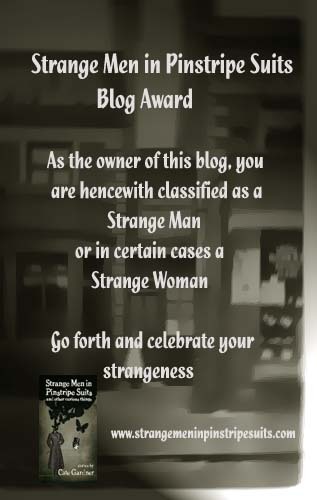 Now you must go forth and celebrate the strangeness of friends (and strangers – strangers are always allowed) by nominating blogs run by strange folk. *Beware, some people don’t like you to refer to them as strange…Try to avoid them if possible. Akasha Savage, because she is crazy enough to write horror. Andrea, from Southern Writemares, because she believes in the paranormal. K. Hinny, from Random Thoughts of a Writery Girl, because she gallivants on the interwebs with the likes of Cate Gardner. Gef, from Wag the Fox, because he reviews more books and movies per week than I can consume in a year. Mercedes, from A Broken Laptop, because she pressures other writers to put on masks and take pictures of themselves for her website. Creepy. Damien Walters Grintalis, because one look at her profile photo and you just *know* she’s cooking up something evil. Kate Jonez. Oh come on. Just look at her website.